With the association of large Quarry area for Quartzite & Sandstone and the factories equipped with excellent infrastructural facilities based at Rajasthan, we can entertain any kind of your requirements with the minimum lead time. With our skilled procurement team and tie up with the most reliable sources (Direct Quarries) and well established SCM, we can cater your any kind of demand for Indian natural stones like Granite, Marble, Limestone, Slates, Stone articles etc. We believe in providing single point solution to your different stone requirements. We are equipped with excellent infrastructural facilities that ensure smooth and efficient operations, storage of products, supply and export. Our supply change management with reliable vendors enable us to meet and satisfy the various requirements of our clients with utmost ease and consistency. Each wooden crate is first inline with polythene to protect stones from staining from wooden planks or from any other feature, then it is inline with foam-sheet along horizontal planks to protect stones against damage from wooden planks or nails. This is a fundamental preliminary packing used for all our wooden crates irrespective of the type of stone packed. In case of outdoor stones like flagstones, landscaping stones, circles, etc which are basically rough stones, they are directly stacked in the wooden crates. Any loose gaps are tightened with filling material like wood, hardboard, foam sheet, etc to protect stone slabs/tiles from colliding with each other. In case of polished stones, surface of each slab/tile is protected by using a paper cloth or 2 mm foam while tightly stacking them in a wooden crate. This protects the polished surface of stones from scratching due to abrasion of dust particles between two tiles. In case of 10 mm or 15 mm tiles which are very thin to break, 6-10 such tiles are first packed in cardboard boxes. These boxes are then tightly stacked in the wooden crate. 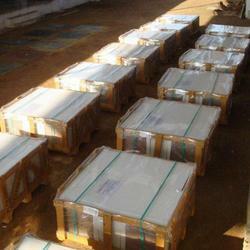 Cardboard boxes provide additional cushion to the thin tiles and prevent them from breakage. In case of softer but costlier stones like polished marble or granite tiles in 10mm thickness, 5-10 such tiles are first packed in Styrofoam (thermocol) boxes and then tightly stacked in wooden crate. In case of mint sandstone, specially, it retains moisture and is off-white to peach-yellow in color. The 15 mm tiles as mentioned above are packed in cardboard boxes but thicker tiles with pencil edge, bullnose or rebated bullnose are individually packed in polythene bags before tight stacking in wooden crates. As a special case the wooden crates are also inline with thermocol sheets for additional protection. We have adopted this special packing method with our experience. We offer option of customized packaging to our customers. At the time of order placement, customers can ask us for any specialized or customized packing requirements which will be duly fulfilled to the best capacity. We continuously strive to further improve our packaging methods as we learn from our customers. We welcome feedback from all customers. We understand that the cost of packing is minimal against the cost of stones and customer satisfaction. Our quality of packing directly reflects the quality of stones we produce. Gangsaw sized Quartzite and Granite slabs are securely stuffed at our factory premises in strong seaworthy wooden pallets.